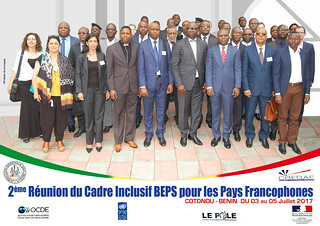 06/07/2017 - Fifty delegates representing 10 countries gathered in Cotonou (Benin) on 3-5 July 2017 for the second regional meeting of the Inclusive Framework on Base Erosion and Profit Shifting (BEPS) for French speaking countries. These regional meetings offer participants from around the world the opportunity to provide their views and input to the Inclusive Framework on BEPS. Participants discussed the latest developments with regards to the implementation of the BEPS Project in the light of the debates taking place in the working groups of the Committee on Fiscal Affairs. A special workshop was dedicated to the Multilateral Convention to Implement Tax Treaty Related Measures to Prevent BEPS and the steps necessary to sign this convention. Participants were also updated on the progress of work regarding the toolkits addressing the specific needs of developing countries. Finally, the discussions allowed identifying the priorities of the countries of the region and their needs in terms of capacity building and training. The meeting was hosted by the Directorate General of Taxes of Benin, and organised by the OECD in partnership with the Centre de rencontres et d'études des dirigeants des administrations fiscales (CREDAF) and the Pôle Stratégies de développement et finances publiques (a joint initiative of UNDP and France). Participants included senior officials from ministries of finance and tax administrations from Belgium, Benin, Burundi, Chad, Côte d'Ivoire, France, Mauritania, Democratic Republic of Congo, Republic of Congo, Senegal and Togo. Representatives of the World Bank Group, from business, trade unions, civil society and the academic world also participated. The Secretary General of the Ministry of Economy and Finance of Benin, Mr. Joël D. Zodjihoue, and the Director General of Taxes of Benin, Mr. Nicolas Yenoussi, opened the meeting which was co-chaired by Mr. François Breitzer Mounzeo, Director of regulation and litigation at the Directorate General of Taxes of the Republic of Congo, and Dr. Ilyass Sina D., Technical advisor for the monitoring of reforms to the Minister of Economy and Finance of Benin. Media queries should be directed to Pascal Saint-Amans, Director of the OECD Centre for Tax Policy and Administration (CTPA) or the CTPA Communications Team.